Very few people are aware that many common chew toys can be very destructive to dog and cat teeth. Contrary to what you might think, dog and cat enamel is much softer than human enamel. After all, their teeth were only designed to last a few years whereas human teeth were designed to last many decades. The objectives are simple. We need to provide relief from boredom and maintain oral health. Some toys accomplish this nicely while others damage teeth, create pain and promote disease. The energy and level of aggression applied to chewing. Some dogs are very aggressive chewers while others are very conservative. The breed, anatomy and facial architecture of the dog doing the chewing. "Giving steak bones is good for my dog and helps clean the teeth". When swallowed whole, can perforate the stomach or intestine. They do not digest and surgery if often required to remove them. "My dog has been playing with tennis balls for years without any problems". Similar to a scouring pad, the fabric coating on a tennis ball is very abrasive and can easily scour away enamel. In some dogs, the enamel can wear away very quickly causing painful dentin exposure and infection. When enough enamel and dentin has worn away, the tooth can easily break. Every once in a while, we receive a frantic call from someone with a dog that has a tennis ball lodged in its throat. These dogs often die before the owners can rush them in and a Heimlich maneuver will not work. Tennis balls can be very difficult even for us to remove. Most often, these are larger breeds such as Golden Retrievers but any dog with a large enough head to allow a tennis ball to pass through the mouth is at risk. As a tennis ball loses internal pressure with time, it can pass through a smaller mouth more easily. 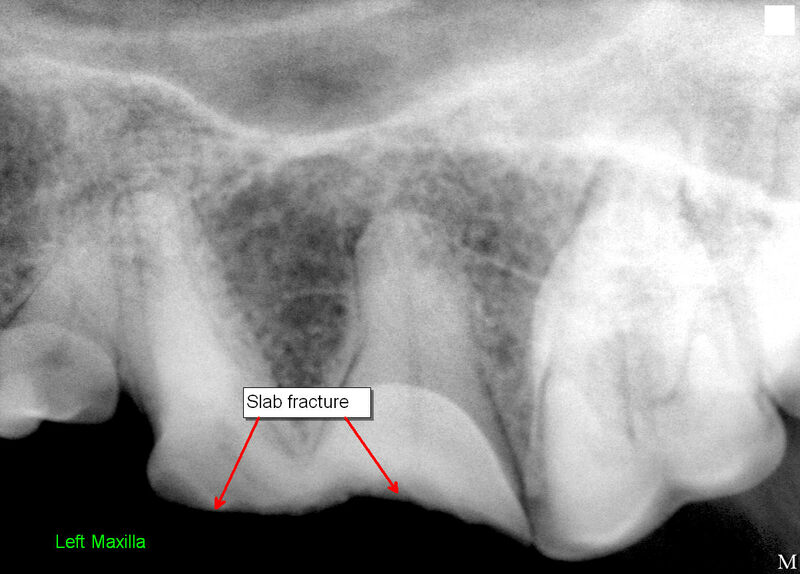 Can you see the broken tooth in this X-ray? The big tooth in the middle, the left upper 4th premolar, is broken and the pulp chamber (dark area in center of crown) is wide open. The pulp is now exposed to the volitile and dirty environment in the mouth. This dog is in a lot of pain and infection is underway. There are many good toys on the market that were designed to minimize tooth trauma. Then there are toys that are given to dogs that were designed for something else. These are the ones that cause the most amount of damage. Nylon or hard plastic bones are a real no no. We see painful tooth fractures all the time when these toys are given. Natural rawhide. It's simply dried out cow skin but dogs really like it. To us, the risks outweigh the benefits though. We do see fractured teeth but we also see esophageal obstructions. Rawhide must reach the stomach to be digested. Rawhide that gets stuck in the esophagus may need to be retrieved surgically or endoscopically. Any toy that you would not want to chew with your own teeth. Any toy that you would not want to be thrown at your forehead. Puppies that have their primary (baby) teeth should not chew or play tug of war. Baby teeth are fragile and can break easily. They contain the same nerves and blood supply that the adult teeth do so a fractured baby tooth is as much of an emergency as a fractured adult tooth. Even fully erupted adult teeth have very thin walls and do not strengthen until they are 1-2 years old. Forceful playing can easily fracture or dislodge baby teeth in such a way that they rest in a crooked position creating contact with gums or other teeth. Fracturing a baby tooth can also create the illusion that it just fell out when in fact, the root has been left behind under healing gums only to cause problems down the road. When choosing a toy, you need to take into consideration the age, breed, current dental health and integrity of the teeth, and the nature of the dog. Will he rip it apart, chew compulsively or does he chew occasionally and gently? A toy that involves the use of many teeth at once is better than a toy that, when chewed, will distribute all of the force on only two teeth. No toy is indestructible. Consider them disposable and discard when worn. Young puppies that really want to chew should be given only soft pillow type or VERY soft rubber toys for teething. Remember that sharp baby teeth can quickly destroy very soft rubber so be sure to discard it once it can be pulled apart. Garage sales are a great source for cheap stuffed animals (wash in hot water first). New toys should be given only when constant supervision is available until you're comfortable with your dogs chewing habits with this particular toy. Rawhide should be processed. Processed rawhide softens in water and poses the least amount of risk if swallowed too soon. The best ones contain chlorhexidine to help control bacteria and plaque formation. Final note please read the beginning of the main dental page on pain. Dogs that have oral pain from toy trauma will not let you know. This will lead you to falsely believe that no problem exists.